That's half the frame. The end pieces are solid timber, and I'll put a 4mm odd ply back on the whole thing to brace it. I'll make the fixed shelves from 9mm ply, sitting on the 90mm wide Tassie Oak cross pieces. I'll add some holes in the legs for adjustable shelves as well. There's quite an amazing amount of timber in this. So far the only metal bits are the adjustable feet, which are already coming in handy as my garage floor is a long way from flat. I've used about 150 little dowels so far. The other thing visible in the photo is the complete shambles aboard Elena. I'm hoping that once I have more storage places in the garage there'll be rather less crap left on horizontal surfaces. 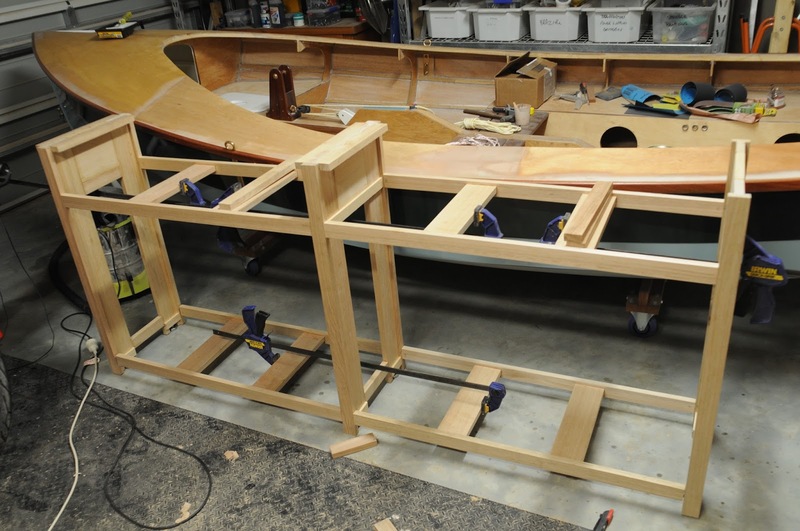 I'm all in favor of knocking up a nice workbench...I put mine together before starting my Nav build. I will say, I didn't find it necessary for building up my hollow spars. I'm not sure what all the fuss is about re having perfectly level fixed molds to hold the staves...?? I cut my staves, and then glued them together, holding it all in with hose clamps every 12 inches or so. The octagonal structure pretty much ensures that the resulting spar will be straight, if you have enough clamps. I can see where a long bench and brackets would be important for say a 40' or 60' but the little stubby that we have on the nav didn't need that much suport. I thought mine turned out pretty well. I was wondering...the mast/pivot tabernacle that you made...I'm guessing you won't be rowing Elena with the mast dropped? One of the reasons I put my hinge higher up was so that if I dropped the mast, I could support it with a cradle in the stern and still have clearance to sit under it and row without all that weight aloft. Also...I thought that when I'm camping, the higher placed hinge would would allow the mast to be used as the peak of a nice, roomy boom tent. What has me worried is more that my mast isn't a proper birds mouth. I started by making the track section, and next want to join a pair of 30x19mm staves on the sides of the track section - see http://www.suzyj.net/2014/10/finishing-birdsmouth-mast-prototype.html. That then gets routed to take other staves, which are more birds mouth like. My concern when I joined the two 24 x 12 pieces of timber to form the track was that it was very floppy, and I was really worried that once joined it would be forever bent. I can see how a proper birds mouth mast pulls itself straight, but alas because I'm building some of mine up a couple of staves at a time it's a lot floppier than that. With the tabernacle, I tried drawing it higher for just the reasons you mention, but it would have to be higher than the boom to really work. I think I can still row with the mast slightly lowered by letting the jib halyard out, thus dropping the mast, so it's at 45 odd degrees, and holding it in that spot with the halyard, then clipping the main halyard to the end of the boom and using that to pull the boom up out of the way. That's sort of the idea, anyway.